Ish Saxena, MD ’13, is a general practitioner (GP) trainee based at the Royal Preston Hospital in the northwest of England. After studying at St. George’s University, he completed a master’s degree in healthcare management at the University of Manchester. He is now involved in innovations in primary healthcare and is currently undertaking a health infrastructure innovation project in his home town. Dr. Saxena is the founder and CEO of “F3’ing It!”, a startup company focused on supporting doctors and providing the best opportunities for those seeking job opportunities or training breaks. The organization, which launched in March 2017, is collaborating with doctors, NHS trusts, and non-NHS organizations throughout the country. His other interests include medical teaching, for which he has received multiple awards from the University of Manchester. Dr. Saxena is also the lead rep for Associates in Training (AiT) at the Royal College of General Practitioners in his region, clinical entrepreneur fellow at NHS England, and a BME Doctors Council member at the General Medical Council in the UK. Outside of medicines, Dr. Saxena also enjoys travelling and keeping his travel blog up to date. You chose to study at St. George’s University rather than staying nearer home in the north of England. It must have been a big decision. Looking back, it was a huge move. I was at school in Liverpool in the UK when I heard about SGU. My main motivation for applying was that I was keen to practice medicine in the United States at some point and saw that SGU would give me that opportunity. 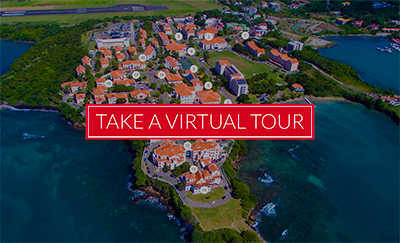 It was only when I arrived in Grenada and started my course that I realized all the other benefits of studying there. The SGU curriculum was challenging, which gave me a vigorous educational experience, and SGU students also get to enjoy stunning beaches after their lectures. Alongside this, the University was extremely supportive with terrific learning resources and we had the benefit of learning from esteemed professors from all over the world. But the best thing about it all was the sense of community. I made lifelong friendships and professional connections, and it’s been great to stay in touch and see how successful my fellow graduates have been. You’ve won a number of awards in your career already. How did SGU give you the platform for success? I’ve noticed that all SGU alumni have a drive to succeed which sets us apart from most students and graduates. I’m certainly very ambitious and excited about the contribution I can make to healthcare and the lives of individuals. After graduating from SGU I completed a master’s degree in healthcare management at the University of Manchester, which has led to a number opportunities for me to get involved in both the management and delivery of healthcare. I’ve been honored to receive the Foundation Doctor Portfolio of the Year award as resident at the Royal Preston Hospital and awards for teaching and education from the University of Manchester. I have the privilege of being the Royal College of General Practitioners lead representative for trainees in my region. I am also Clinical Fellow at the NHS England entrepreneur scheme and a BME doctors council member at the General Medical Council in the UK. SGU gave me a great base in terms of scientific knowledge and I draw on that in my day to day work. It was also the starting point for my clinical skills and I learned a breadth and range of topics I wouldn’t have benefited from elsewhere. For example, I had the opportunity to study parasitology which has meant I’ve been able to help patients with tropical diseases back in the UK. My strong education and international experience at SGU and my time working at Brooklyn Hospital in New York has helped me achieve what I have today. Alongside your day job, you volunteer your time to help new medical students. You must be extremely busy. I am busy but I think it’s important to contribute back and help give opportunities to future generations of medical students. I came back to the UK after working in New York because I felt I could contribute more here. I wanted to draw on the practices I’d learnt in the United States to make improvements in healthcare in my home country. I help students from the University of Manchester and teach them about the practicalities of working in a large hospital. The NHS is struggling at the moment so it’s vital that new doctors are helped to settle in and that the best possible care for patients is promoted. I’m interested in becoming a general practitioner (GP) because it’s a good mix of direct care and healthcare management. I plan to be an NHS GP in the next few months and will continue to work towards improving the delivery of primary care. It’s very likely that this field of medicine is going to change in the next few years because of our aging population, and it’s important that both doctors and patients are educated and ready for these changes. I’m currently working on the creation of a screening system for frail patients so they can be treated at home. In the not-too-distant future, I also hope to see personalized care delivered close to home by bringing specialists into local practices. Every day is bringing different highlights and new challenges. Living my dream of being a doctor is phenomenal, and I’m very lucky to be able to say I love my job. Dr. Georges Karam spent his childhood in Lebanon and studied as an undergraduate at the American University of Beirut. He became a student at St. George’s University in 1999 and received his Doctor of Medicine in 2003. After graduating from SGU, Dr. Karam pursued a general psychiatry residency at Washington University in St. Louis, Missouri, then a geriatric psychiatry fellowship at the University of Pittsburgh. He went on to qualify with the American Board of Psychiatry and Neurology in 2008 and the American Board of Geriatric Psychiatry in 2010. He returned to Lebanon following his stint in the United States in order to establish a psychiatric practice in Beirut. Dr. Karam is now the acting chairman and assistant professor at the Department of Psychiatry and Clinical Psychology of St. George Hospital University Medical Center, Balamand University, Faculty of Medicine in Lebanon. He is also a senior member of the Institute for Development, Research, Advocacy and Applied Care (IDRAAC) and the President of the Alzheimer’s Association of Lebanon. He sits on a number of committees, including the HelpAge Global Network, Lebanon’s National Committee for Palliative Care, and the Lebanese Psychiatric Society. In 2018, he was awarded the Arab Social Creativity Award by the Arab Thought Foundation. Dr. Karam is a published researcher specializing in the mental health of older populations. In 2011, he contributed to a collaborative World Alzheimer’s Report for the World Health Organization (WHO) and Alzheimer’s Disease International (ADI). Many SGU students go on to residencies in the United States after graduating. Was this something that appealed to you when choosing universities? Absolutely. I knew that working in the US would open up terrific career opportunities and that SGU could provide the platform I needed to get there. I was also interested in psychiatry, having been influenced by my father (who was a psychiatrist) and I knew that SGU would be a good starting point for a career in this field. After SGU, I had the privilege of taking up a general psychiatry residency at Washington University in St. Louis and then a geriatric psychiatry fellowship at the University of Pittsburgh. St. Louis in particular was an exceptional place to practice psychiatry, and I flourished there and eventually became chief resident. What were the other benefits of studying at SGU? Firstly, I learned so much at St. George’s University. The teaching was excellent and it gave me the springboard for everything I have achieved since. The facilities and resources were outstanding, which made for a very pleasant teaching environment and campus. It was also a very collaborative environment. I made great connections and friendships there. I also took advantage of living on a Caribbean island and discovered a love of scuba diving. You returned to Lebanon following your residencies. What did you hope to achieve in the field of mental health back in your home country? I had developed an interest in geriatric psychiatry, including conditions like Alzheimer’s disease. Provision for this and other mental health conditions is limited in Lebanon, and I was keen to improve this and make a difference to vulnerable people. So, despite receiving a number of job offers in the US, I returned to Lebanon to set up my own practice in Beirut. I’m now an advisor for the Lebanese Ministry of Health and work with NGOs to improve support for people suffering from mental illness. I’m the vice president of the Center of Studies on Aging, president of the Alzheimer’s Association Lebanon, and secretary of the Lebanese Psychiatric Society, as well as a member of a number of other committees including the HelpAge Global Network. This work is all interesting to me on a professional level but, more importantly, the organizations are indicative of the increasing commitments of policy makers and healthcare professionals to tackle mental illness in Lebanon. How do you apply your research to your day to day work? I have led a number of research programs looking into dementia, depression, anxiety, schizophrenia, and other mental health conditions and worked on international research with a number of countries. In 2011, I contributed to a collaborative World Alzheimer’s Report for the World Health Organization (WHO) and Alzheimer’s Disease International (ADI). The report raised awareness of dementia as a public health priority, and its findings and recommendations have been replicated in 27 countries. The number of people living with dementia worldwide is estimated to be over 35 million, and this number will increase significantly in the coming years. I’ve seen how it can be devastating not only for the people who have it, but also for their caregivers and families. In 2017, I worked on research that looked into this issue in Lebanon specifically. While the burden on and mental well-being of family carers for the elderly, especially those with dementia, has been well studied in high-income countries, and to a lesser extent in the Arab region, our study of Lebanese carers gave us a local perspective and highlighted the importance of considering the psychological well-being of the family carer, and the role of dementia and depression in increasing the burden of care. This local-level research prompted me to set up a daycare center for people who have dementia in Beirut. The center provides safety and security, organizes mentally stimulating activities and memory games which help delay the progress of the disease, as well as provides crucial respite for carers. It’s satisfying to know that my work is important for Lebanon but also for the global population. It’s fascinating to be involved in research that I hope to see treatment and cures for diseases within my career. Dr. Abdulla Al-Khan is the vice chair and division director of maternal-fetal medicine and surgery at Hackensack University Medical Center, which is part of the Meridian Healthcare System. He is also the director and founder of The Center for Abnormal Placentation at Hackensack University Medical Center in New Jersey. As a double-board-certified physician, he holds academic titles as an assistant professor of obstetrics and gynecology at the University of Medicine and Dentistry of New Jersey, New Jersey Medical School, and Seton Hall University School of Graduate Medical Education. He is an associate professor at St. George’s University School of Medicine. After completing medical school at St. George’s University, Dr Al-Khan took an internship at Mount Sinai School of Medicine in New York City and a residency in obstetrics and gynecology at Seton Hall University in New Jersey. He was in academic faculty practice for two years and then proceeded to a three-year fellowship in maternal fetal medicine at the University of Medicine and Dentistry at New Jersey Medical School. Dr. Al-Khan is recognized as an expert in high-risk pregnancy, caring for patients with the most complex medical and surgical conditions. He was the first physician in the world to perform a robotic transabdominal cerclage on a pregnant patient. In 2008, he established The Center for Abnormal Placentation at Hackensack University Medical Center, a multidisciplinary center that was the first in the world to coordinate the care of patients who present with placenta accreta, a major cause of obstetric hemorrhage and maternal mortality. What initially drew you to a career in obstetrics and gynecology? I enjoyed all aspects of my medical studies, but I chose obstetrics and gynecology because it offers a combination of a number of disciplines, including pediatrics, surgery, psychiatry, radiology, and urology. It’s extremely rewarding to help women who have difficult pregnancies to deliver a healthy baby. It allows you to make an impact on the person in your care, wider society, and generations to come. In 2008, you established the world’s first Center for Abnormal Placentation at Hackensack University Medical Center. What motivated you to do this? Placenta accreta is a serious pregnancy condition that occurs when the placenta grows too deeply into the uterine wall and other pelvic structures (primarily the bladder). It’s a major cause of obstetric hemorrhage and maternal mortality. Fifteen years ago, I witnessed a pregnant woman suffering from placenta accreta in her second pregnancy. She required emergency treatment, 12 hours of surgery, and three days of surgical ICU admission on a ventilator with an open abdomen, followed by numerous surgeries in order to save her life. I told myself that I never wanted another woman to experience this. I dedicated my time to finding effective diagnoses and treatments for this condition and now have models which are replicated in the world’s leading hospitals. The center provides much-needed comprehensive services to women who currently have no other place to go for expert care. Our innovative program has been developed and designed to serve as a template for regional, national, and international institutions. It has led to the improvement of pre-delivery diagnosis and delivery complications have been significantly reduced. We have operated on 250 pregnant women with placenta accreta and have had a 100 percent success rate. I now have four PhD researchers dedicated to developing further diagnosis techniques and treatments, and our methods are being practiced across the world. We also have two senior research scientists actively working on data collection and outcome analysis. I have helped set up our care for placenta accreta programs across Europe, the Middle East, Far East, and of course the United States. What are your hopes for the future of maternal health care? Over 500,000 women die worldwide each year from pregnancy-related conditions. That is unacceptable. It’s heartbreaking to visit developing countries and see the rates of avoidable maternal death. Wealthier countries can change this by donating medical equipment we no longer use and continuing to research and share our knowledge with practitioners across the globe, particularly those with limited resources. In developed countries, we’re seeing a significant increase in births by cesarean section each year, which directly contribute to problems with placental formation in subsequent pregnancies. Because of this, the incidence of placenta accreta will continue to rise, as will mortality rates for pregnant women. This trend is set to continue so further research is crucial if we’re going to improve the health outcomes of pregnant women and their babies. My goal is to establish methods for diagnosing placenta accreta in pregnant women with 100% accuracy as early as possible so we can provide timely treatment and avoid maternal deaths. How did your experiences at St. George’s University shape your career? My time at St. George’s was extremely beneficial. Living in the Caribbean for two years was very different to my childhood in Bahrain and teenage years in the United States. I was 21 when I started my studies there and it made me mature quickly and gave me a work ethic and drive to succeed. My class of medical students was relatively small so we became close and this created a great support system. All the St. George’s professors were outstanding, and they encouraged me to push myself and have belief in my abilities. I received a fabulous education at SGU, and my desire to learn and succeed is still with me today. What advice would you give to medical students at the start of their careers? I would say that, while nothing in life is easy, if you work hard and take opportunities as they appear, then there are no limits to what you can achieve. Throughout your career, if you have ideas, speak up and be persuasive. Think big and never settle for less. Last summer, you completed your interventional cardiology fellowship at North Shore University Hospital and began at Peconic Bay as an attending. How do you look back on the journey? “It’s a little surreal. Each step along the way, you’re so focused on the next step in the process—residency, chief residency, fellowship, getting a job, another step exam, another board exam. Now I look back, I am so thankful for where it’s taken me and for those who have helped along the way. PBMC opened its new cardiac cath lab in October 2017. How has that changed the landscape of medicine in the region? “Before the cath lab opened, patients would have to be transferred from here or Southampton Hospital all the way to Stony Brook University Hospital, which is an hour away give or take. It was an underserved population as far as Long Island goes. The new facility has already made such a difference. What initially prompted you to pursue cardiology? “It had been my dream to be a doctor since I was 2 or 3 years old. One of my best friends growing up had open heart surgery twice, and seeing him go through that, with several trips to the hospital at such a young age, it’s one of those things that drew me toward cardiology. “As an undergrad, I did some research through the Pediatric Cardiomyopathy Registry, which tracks children who inherited conditions that led to heart failure. I worked under Dr. Daphne Hsu, who was with Columbia at the time and is at Montefiore Medical Center, sitting in on procedures and consulting with patients. “Then at SGU, I spent all of my first clinical year at Maimonides Medical Center, which is where I was born. When I was there—in addition to meeting the doctor who delivered me—I saw just how much cardiology factored into just about everything that went on there. We saw a wide array of patients of different ages and ethnic backgrounds. How would you describe your experience at St. George’s University? In what ways did SGU’s support services help you during your time as a student? “I received tutoring in anatomy and histology, which I hadn’t done much of in undergrad. Medical school is completely different from anything you’ve done before just because of the sheer volume of material that there is. At first, you don’t even know where to begin. The support and tutoring at SGU really help you focus your attention and give you the confidence that you can get through it. I’m very grateful for the help. You grew up in Brooklyn and did much of your medical training there as well, including most recently as a gastroenterology fellow at the Brooklyn Hospital Center. How much did that background play a role in your decision to stay on as an attending physician? What has the transition from fellow to attending been like? Whereas a fellow is usually concentrated on the nitty gritty of a clinical case, an attending is responsible for that in addition to various social, administrative, and financial factors surrounding it. I have found that once you understand the medical aspects, the rest falls into place. There was some trepidation to remain in a program where I did my fellowship, but the process has been quite a natural transition for me. As a mentor, it’s rewarding when you’re doing procedures with a fellow, and you see significant progression in skill level over the course of a few weeks or months. How did your upbringing shape your future as a physician? I was born in Venezuela, and spent my formative years both in Grenada and Brooklyn. Growing up in each place really grounded me. Health care in Grenada is quite different than the US. However, as is the case in many parts of the world, both places are have groups of people with less access to specialized medical services. That was one of the driving factors in my decision to become a doctor and later to become a gastroenterologist. It’s important to me, as a physician, to give back and serve people who would otherwise not have access to specialty medical care. During my fellowship and now as an attending, I’ve focused a great deal on colon cancer screening and awareness. There really is a lack of it in many parts of the world. We need to remedy that because, while colon cancer can be a devastating disease if caught in its later stages, it is also quite preventable. I have to thank one of my mentors, Dr. Marios Loukas, who helped form the research fellowship in Grenada. I was part of the first class there and that experience was very beneficial and a nice launching pad into residency and even further into fellowship. Was becoming a gastroenterologist always the end goal for you? Not at all. I grew up playing the saxophone and piano, so at one point I thought I was going to be a jazz musician. Eventually though, there was a stronger calling to humanitarianism which guided me to pursue medicine. At the start of my residency I thought I wanted to become a primary care physician, working in the community. I gradually realized that what I enjoyed more was being an authority on one particular field of medicine, which in this case was gastroenterology. What’s great about gastroenterology is that it isn’t monotonous. For me, I sometimes do consulting rounds on the medical floors and see office patients in the morning and focus on procedures in the afternoon. There is never a dull moment. What advice would you give to a student who is just beginning his or her studies at SGU? I encourage them to keep an open mind about the academic and cultural experience that SGU affords. In addition to focusing on their studies, I would try to immerse myself in some of the different activities that are happening everyday on campus. It is also important to forge long-lasting mentoring relationships and friendships that help you grow as a person and eventually factor into you becoming a great physician. You grew up in New York. What prompted you to move out west? Molecular pathology is a very small specialty, and it just so happened that the spots in New York were filled by the time I was applying. After that, I really wanted to live in Los Angeles over some of the other cities on the west coast, and I thought the training at Cedars-Sinai would be great not just in terms of academics but the practical, on-the-ground education that really propelled me into the position that I’m in now. By the end of fellowship, I was fully confident that I would be able to run a lab. I met my wife, Selina Vail, during first term at SGU. She’s now a family medicine physician. We live two blocks away from the hospital, and she works at an urgent care center four blocks in the other direction, so it works out. What type of personality does it take to be a pathologist? Everyone says a pathologist has to be reserved and antisocial, but I think that’s a really poor way of looking at it. I’m the exact opposite. Even though I’m not dealing with patients, we’re dealing with the rest of the patient care team, whether they’re oncologists, radiologists, or other clinicians. Essentially, we help to formulate the basis for which patients get treated. Almost every patient in the hospital has labs, so the way I see it, we’re treating every single patient in the hospital even if we’re not directly seeing them. In the lab, you mentioned that you have limited patient interaction. What are the pros and cons of that setup? Pathologists are the doctors’ doctor. You’re the one that, in the end, everyone comes to, and it’s your job to say, “this is the diagnosis; this is the answer.” There’s a mystery there, a puzzle to be solved, and pathologists get to be the final arbiter on most diagnoses. It’s immensely rewarding. I definitely miss patient interaction, which is something that I enjoyed a lot during medical school, but it’s one of those things where you close one door and open another. I think the benefits of this specialty, in a professional and intellectual sense, far outweigh the negatives. In addition to your work in the lab, you’ve been active in academia. What has drawn you to that role? I’ve been an instructor for both small-group and large-group sessions since residency, and expect appointment as an assistant professor here shortly. My feeling is, what’s the use of having all of this information if you don’t pass it on to the next generation? It’s amazing to see when something just clicks with someone. You start talking about something and you can see the gears going, and then all of a sudden they just light up. It’s a great feeling. How has the SGU experience prepared you to be a successful physician? When you go down to the island, you’re faced with a situation that you’re not used to. You’re on your own, yet you make new friends and your success is based on your own skill and work ethic. You need to be able to perform and to do it in a way that is acceptable for everyone. The experience really sharpens your teeth and hones your drive. But you can’t make a diamond without pressure. You need that sort of pressure to push forward. With all the pressure that comes with medical school—any medical school—there was ample opportunity to relieve stress if you could. I lived in Lance aux Epines and looked out at Prickly Bay. It was pretty ideal. That said, another great quality that that taught us was restraint, the ability to moderate both your work and your play. You can’t succeed by just working. You need to compartmentalize your life. Learning to do that makes you a better doctor and a better person. My group of friends at SGU included some of the best, brightest, and hardest-working people who also knew how to relax when they weren’t under the gun. That sort of balance led every single one of them to be immensely successful. There’s nothing better than working hard all day, finishing up, and going on a sunset cruise. No American school can compete with that. My experience at SGU was fantastic. I look back on the entire experience with nothing but tremendous fondness. In addition to being an interventional cardiologist, you have long been an advocate for women in medicine. What drives you to be a pioneer in that initiative? I want to see that there is equality and fair representation of women and minorities, not only as patients in clinical trials but also across the field of medicine. The number of female cardiologists delivering health care to patients is tremendously low–just 20 percent. And for interventional cardiologists, it’s under 5 percent. Women also earn considerably less over the course of their careers than men. My mission is to make sure that women are well represented and well respected. Have the numbers improved over the years? Not as much as they should. If you look at the last 10 years, the percentage of interventional cardiologists in the US who are women has stayed between 4 and 8 percent. I recently wrote in JAMA Cardiology that I felt women had cracked the glass ceiling, but we really haven’t. We’ve made important strides, but there is still so far to go. For your work, you were recently bestowed the Wenger Excellence in Medical Leadership Award by WomenHeart, as well as Bernadette Healy Leadership in Women’s Cardiovascular Disease Award from the American College of Cardiology. What was your reaction for earning such distinctions? I’m very humbled. These awards fuel the fire in me to continue this work and reduce cardiovascular disease in women and minorities. In fact, improving the care of women with cardiovascular disease also ties closely with my work to improve representation of female cardiologists. There is strong evidence connecting female cardiologists to improved outcomes for female patients. It’s unconscionable to believe that, in 2018, there’s discrimination against women in medicine. We have to stop that. It’s an honor to receive awards, but it’s not about the recognition. It’s about having a platform to help my fellow women colleagues, as well as patients, who are underrepresented. Going back to when you were first getting started. How did a career in cardiology come on to your radar screen? I was part of one of the very early classes of SGU, and very determined to build a career in medicine. I didn’t want to go into cardiology immediately, but my exposure to cardiology, my love for cardiology came when I was a fourth-year student at Mount Sinai Hospital. I remember working in the critical care unit and loving every single minute of what I did. Once I got to the catheterization lab, I knew that that’s what I wanted to do, even if it meant working the crazy hours. Twenty-five years later, I can say very strongly that it was absolutely the right choice. Can you elaborate further on the passion you have for this particular field? Interventional cardiology is one of the most rewarding sub-specialties. We get to perform procedures involving cutting-edge science. I’m able to work on one of the biggest problems in the world—cardiovascular disease. We are literally saving lives every single day. To be in the driver’s seat for that, how much better could it be?